For just $180, we provide the space, age-appropriate entertainment, tables and chairs and the clean-up. All you have to do is show up and watch your child and friends have a blast! We offer an hour of gymnastics or Ninja play with a coach and 45 minutes of party time for up to 15 kids (more guests can be accommodated for a fee of $5 per extra child). You may bring your own decorations, food and paper products if needed. We offer parties on Saturday afternoons, please pick your time and then leave the fun to us! Now offering NINJA PARTIES, CHEER PARTIES and SLEEPOVER PARTIES! Make your request in the notes section when booking.Want a party that's easy, memorable and full of activity? See New Kent Parks and Rec brochure for details! 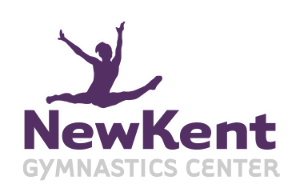 Contact info@newkentgym.com for Full Day Camp information. Our doors are open to preschools, day cares, home school, scouts, groups even business team building! Our coaches will create a program lesson catered to what you are looking to achieve. Come one time or on a weekly or monthly basis! $7.50 per person for an hour event. Contact us to book. Once a month the gym is all yours! Get some extra practice (or burn some energy) and the entry fees goes to the NKGC Parent's Association. Come play and support our gymnastics team! We offer private lessons for all ages and abilities. You do not need to be a student to request one either! Get one-on-one attention or a small group of two or three. Same price either way, $50 an hour, $25 for 1/2 hour. Privates with competitive gymnastics team coaches are $60 an hour, $30 for 1/2 hour. Contact us for requests or book on the Events Calendar. You must have a zero balance to schedule. Themed sleepovers will be on the events calendar periodically. These sleepovers are EPIC. We play group games, have dance contests, make forts to sleep in and generally have an awesome (and crazy) night! Once we release the date, register online on the events calendar before it fills up.